With several fresh buns ready for sandwiches I decided to make a slow cooker version of meatballs for our Italian Sunday supper. While I was tempted to make a Sicilian al forno version of meatballs I decided to go with something more traditional and while a much more involved family recipe was just not what I wanted to get into, combining elements of my recipe with an adapted Jaime Oliver Gennaro’s version for my cooking club contribution this week was doable. Jaime’s recipe is below, but feel free to make your own meatballs and sauce. 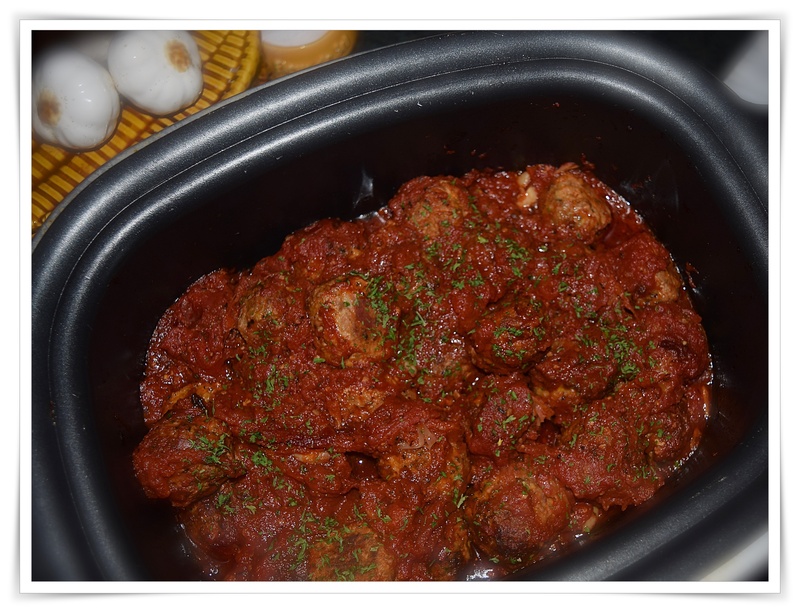 Pan fry or oven roast meatballs until lightly browned, place into a slow cooker and cover with roasted tomato sauce and cook on low for 3 hours at least or until meatballs are nice and tender, but not falling apart. *Slice buns and spread homemade garlic over the inside halves, gently grill or pan toast. Canned San Marzano tomatoes as well as a few fresh plum tomatoes were roasted on Thursday for a delicious chunky sauce so I will simply add fresh roasted peppers some of that sauce to cover the meatballs in the slow cooker. 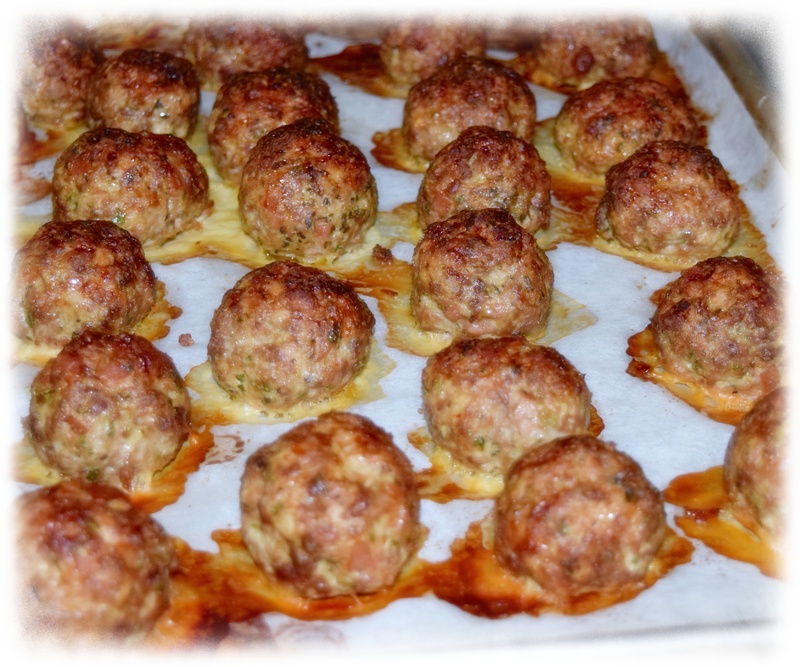 A blend of pork veal and beef for the meatballs was the meat base and additions of traditional meatball ingredients and seasonings makes for great make ahead, package and freeze quick week night dinners, for us great Sunday family style Italian meatball sandwiches. 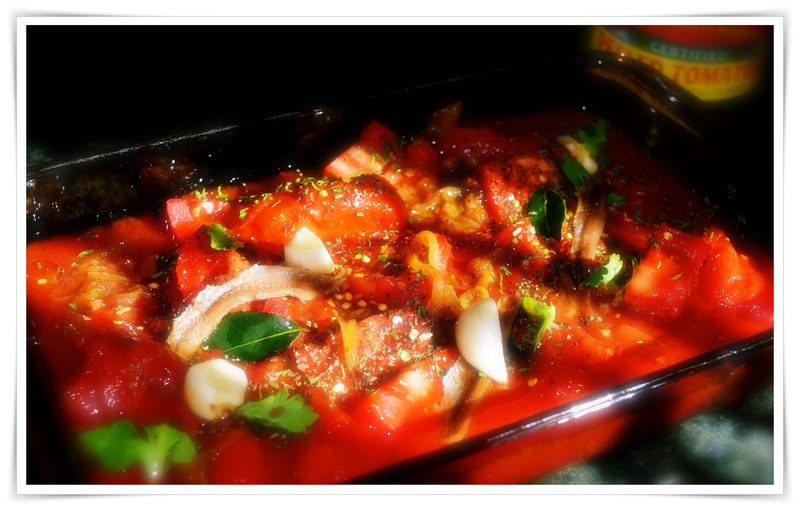 Roasted tomato sauce is so easy to make and I usually make enough for a few meals so start with a high quality San Marzano tomatoes and a few cut up Italian plum tomatoes spread over a large baking dish or two if necessary and season with fresh or dried oregano, basil, thyme and red pepper flakes. Cut a few anchovies (in oil) in half and place over tomatoes, scatter a few fresh cloves of peeled garlic over, drizzle with a little EVOO and a few dots of unsalted butter. Roast in the oven at 400º for 30 – 45 minutes, but watch closely and stir once. Remove from the oven and smooth a little for a chunky sauce or use a stick blender to puree it just a little, but be sure to remove the tomatoes to a bowl before processing. Preheat the oven to 425ºF. Cut away and discard the ciabatta crusts, tear into chunks and place in a bowl. Cover with cold water and leave to soak. Meanwhile, finely slice the mortadella, 2 garlic cloves and the parsley leaves, then place into a large bowl with the meat, eggs and grated Parmesan. Squeeze the water out of the bread and add to the bowl. With wet hands, scrunch and mix everything together, season well with salt and pepper, then divide and roll into 12 equal-sized balls. Place in a roasting tray (about 25cm x 30cm), drizzle over a little olive oil and place in the fridge for about 10 minutes to firm up. Meanwhile, finely chop the remaining garlic cloves, the onion and chilli. Drain and finely chop the peppers, reserving the brine. Place the meatballs into the hot oven for 15 to 20 minutes, or until golden, shaking the tray from time to time to stop them from sticking, then place directly over a low heat on the hob. Add the wine, allow it to boil and bubble away, then stir in the onion, garlic and chilli and cook for a few minutes, or until turning golden. Stir in the peppers and brine, and the plum tomatoes, breaking them up with the back of a spoon, then season and add a splash of balsamic vinegar. Return the tray to the hot oven for 20 to 30 minutes, or until the meatballs are cooked through (if the meatballs start to golden too quickly, cover the tray loosely with tin foil). Cut the mozzarella into 12 slices, then carefully place on top of each meatball and return to the oven for a further minute, or until melted. Open out the bread rolls, fill each with a cheesy meatball, spoon over the tomato sauce, then add a drizzle of balsamic vinegar. Push down on the sandwich to squish it shut, then tuck in.